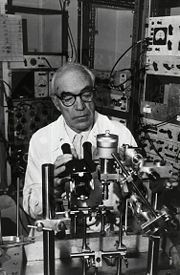 Sir John Carew Eccles (January 27, 1903 – May 2, 1997) was an Australian neurophysiologist who won the 1963 Nobel Prize in Physiology or Medicine for his work on the synapse. He shared the prize with Andrew Fielding Huxley and Alan Lloyd Hodgkin. Eccles was the recipient of many honors, including a knighthood in 1958. In 1963, he was named "Australian of the Year." His research contributed significantly to knowledge of the neurophysiological processes by which thought is processed, and to unraveling the complexities of the human brain. Eccles was widely read and presented in his Gifford Lectures in Natural Theology, a sweeping view of the scientific understanding of big questions, starting with the origin of the universe and ending with human consciousness and the issues surrounding the relation of mind and brain. At every step he took pains to point out the essential mystery underlying the scientific answers, and to assert his view that scientifically based materialist explanations were intrinsically incomplete and unable to provide meaning to life. In his specialty of neuroscience, he was a forceful and nearly singular voice upholding the view that the human mind included a part existing distinctly from the physical brain and not explainable as an epiphenomena of that brain. Eccles was born in Melbourne, Australia. He attended Melbourne High School and graduated from Melbourne University, in 1925. He was awarded a Rhodes Scholarship to study under Charles Scott Sherrington at Oxford University, where he received his Doctor of Philosophy in 1929. In 1937, Eccles returned to Australia, where he worked on military research during World War II. After the war, he became a professor at the University of Otago in New Zealand. From 1952 to 1962, he worked as a professor at the Australian National University. He won the Australian of the Year Award in 1963, the same year he won the Nobel Prize. In 1966, he moved to the United States to work at the Institute for Biomedical Research in Chicago. From 1968, until his retirement, he was a professor at the University at Buffalo. He retired in 1975. After retirement, he moved to Switzerland and wrote on the mind-body problem. Eccles married his first wife, Irene Frances Miller of Motueka, New Zealand, in 1928. They had four sons and five daughters. Two of his sons are also scientists. One is a radar meteorologist. One of his daughters, Rosamond, has collaborated with him in much of his neurophysiological research. In 1968, Irene and John Eccles were divorced and he married Helena Táboríková of Prague, Czechoslovakia, who is an M.D. of Charles University and a neurophysiologist. They also collaborated in their research.. He died in 1997, in Locarno, Switzerland. In the early 1950s, Eccles and his colleagues performed the research that would win Eccles the Nobel Prize. To study synapses in the peripheral nervous system, Eccles and colleagues used the stretch reflex as a model. This reflex is easily studied because it consists of only two neurons: A sensory neuron (the muscle spindle fiber) and the motor neuron. The sensory neuron synapses onto the motor neuron in the spinal cord. When Eccles passed a current into the sensory neuron in the quadriceps, the motor neuron innervating the quadriceps produced a small excitatory postsynaptic potential (EPSP). When he passed the same current through the hamstring, the opposing muscle to the quadriceps, he saw an inhibitory postsynaptic potential (IPSP) in the quadriceps motor neuron. Although a single EPSP was not enough to fire an action potential in the motor neuron, the sum of several EPSPs from multiple sensory neurons synapsing onto the motor neuron could cause the motor neuron to fire, thus contracting the quadriceps. On the other hand, IPSPs could subtract from this sum of EPSPs, preventing the motor neuron from firing. Apart from these seminal experiments, Eccles was key to a number of important developments in neuroscience. Until around 1949, Eccles believed that synaptic transmission was primarily electrical rather than chemical. Although he was wrong in this hypothesis, his arguments led himself and others to perform some of the experiments which proved chemical synaptic transmission. Bernard Katz and Eccles worked together on some of the experiments, which elucidated the role of acetylcholine as a neurotransmitter. I accept all of the discoveries and well-corroborated hypotheses of science—not as absolute truth but as the nearest approach to truth that has yet been attained. But these lectures will reveal in case after case that there is an important residue not explained by science, and even beyond any future explanation by science. This leads on to the theme of Natural Theology with the idea of a Supernatural beyond the explanatory power of science. … As a dualist, I believe in the reality of the world of mind or spirit as well as in the reality of the material world. Furthermore I am a finalist in the sense of believing that there is some Design in the process of biological evolution that has eventually led to us self-conscious beings with our unique individuality. … I will suggest in later lectures that we are creatures with some supernatural meaning as yet ill defined. In his last book, written when he was nearly 90 years old, Eccles wrote that he had achieved success in his "lifelong quest to find the scientific explanation of dualism." Eccles and his collaborator, the German quantum physicist Friedrich Beck, propose a model of interaction across the mind-brain interface. In the model, intention affects the quantum probability that neurotransmitters will be released across a particular synapse in the brain. Eccles recognizes that this is still a hypothesis and one that will be difficult to test, but he feels fulfilled in finally having a hypothesis to offer in the face of the decades of opposition from materialist neurophysiologists who assumed that even a reasonable hypothesis about dualist interaction was impossible. I maintain that the human mystery is incredibly demeaned by scientific reductionism, with its claim in promissory materialism to account eventually for all of the spiritual world in terms of patterns of neuronal activity. This belief must be classed as a superstition … we have to recognize that we are spiritual beings with souls existing in a spiritual world as well as material beings with bodies and brains existing in a material world. Darwin, he said, failed "to account for our experienced uniqueness, I am constrained to attribute the uniqueness of the Self or Soul to a supernatural spiritual creation. To give the explanation in theological terms: each Soul is a new Divine creation which is implanted into the growing foetus at some time between conception and birth. I here express my efforts to understand with deep humility a self, myself, as an experiencing being. I offer it in the hope that we human selves may discover a transforming faith in the meaning and significance of this wonderful adventure that each of us is given on this salubrious Earth of ours, each with our wonderful brain, which is ours to control and use for our memory and enjoyment and creativity and with love for other human selves. Holding such strong and contrarian views throughout his long career, Eccles became accustomed to challenging colleagues to define themselves and be clear about the implications of the premises underlying their research. He also became accustomed to being criticized for his views by colleagues, for whom Eccles's dualism was little more than a dead idea from a bygone era. As Eccles neared the end of his active research career in the early 1970s and looked forward to an active emeritus status in which he would be free to pursue his many philosophical interests, he became centrally involved for several years as a participant, and then chairman, of the International Conference on the Unity of the Sciences (ICUS) sponsored by the International Cultural Foundation. With support from the International Cultural Foundation to assemble high level scientists and scholars of all disciplines to discuss topics related to the central themes of "Science and Absolute Values" and "Unity of the Sciences," Eccles gathered together from around the world academics who resonated with the conference themes and with his own efforts to assure that the gates of scientific discourse were not closed around a narrow focus, excluding efforts to integrate spiritual dimensions into that discourse. Eccles challenged participants to extend themselves in the area of values and in bridging their area of expertise with other academic areas. Setting an example, he offered contributions on culture, freedom of the will, and speculations on death and the meaning of life. Eccles also was a strong advocate and collaborator with his long-time friend, Sir Karl Popper, in promoting understanding of the importance of the hypothetico-deductive approach to science, in which the scientist must formulate a hypothesis and deduce from that consequences that can be falsified by testing. In his own research, Eccles was fastidious in pursuing such an approach once he had learned it from Popper, when Eccles was at the beginning of his career. The two collaborated in writing Eccles's most frequently referenced philosophical work, The Self and its Brain: An Argument for Interactionism. Eccles received many honors. These include a knighthood (1958), the Fellowship of the Royal Society (1941) and of the Australian Academy of Science (of which he was President, 1957-61), and honorary doctorates from a total of nine Universities, ranging from Cambridge (1960) to Yeshiva University, NY. He is especially popular among those who value his reconciliation of science and faith. His work on the processes of the brain remains a significant contribution to science. Curtis D.R. and P. Andersen. "Sir John Carew Eccles, A.C." Biographical Memoirs of Fellows of the Royal Society. Royal Society 47(2001): 159-87. Pratt, David "John Eccles on Mind and Brain," November 1997. Original article published in Sunrise, June/July 1995 John Eccles on Mind and Brain Retrieved October 19, 2007. Scott, John. 2006. "BIOGRAPHICAL MEMOIRS—Sir John Carew Eccles." Proceedings of the American Philosophical Society Held at Philadelphia for Promoting Useful Knowledge. 150(4): 673. Stuart D.G. and P.A. Pierce. "The academic lineage of Sir John Carew Eccles (1903-1997)." Progress in Neurobiology. 78, 2006(3-5). Sir John Eccles Biography. Nobel Foundation. John Eccles on Mind and Brain by David Pratt - a theosophical view. Neurons and synapses. The history of its discovery IV. Chemical transmission by Renato M.E. Sabbatini, Brain & Mind, 2004. History of "John Carew Eccles"
This page was last modified on 14 May 2018, at 20:55.